Bayonet, Bayonet, Who’s Got the Bayonet? The DrillMaster Bayonet is for the M1 Garand and M1903 rifles, it is a real bayonet, but the blade tip is rounded, it does not have a sharp edge and has welds for extra stability- there is also an unwelded version. Armed drill has a certain amount of danger; drilling bladed ups the ante considerably. The DrillMaster Bayonet is a ‘safer’ bayonet for Drillers. Click on the DrillMaster Bayonet tab to order yours now! Click here and find out all about the DrillMaster Driller’s Bayonet. Gary Cunningham has a website that has a great deal of information about bayonets. Made post WW2 (mostly in the 1950s) in other countries. Excellent copies, parts usually interchangeable. Italy – several possible letter markings, does not use the US Shell and Flame mark. Denmark – marked FKF, no shell and flame. Japan – marked N P with a J under the shell and flame. Taiwan – marked 60-6 over KS (markings inverted), no shell and flame. Norway – marked with a crowned ornate K over the shell and flame. 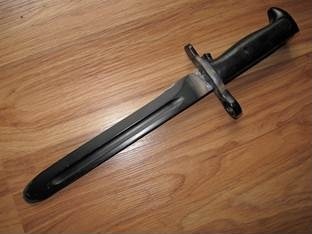 You will want to get a reproduction bayonet since real bayonets can be expensive and can also be collector’s items. This is awesome! I hope this comes out very soon because i would most definately love to start exploring bladed drill. Thanks for the kind words. I’ll let everyone know as soon as it is in production. Are the Drillmaster Beyonets produced yet? I would love to use one on my rifle. Thanks for the question. I don’t have a time table at all since it is an initial funding issue (the tooling and then creation process). I will keep everyone updated through the website. Hello Trey, it’s not for sale- yet. I still have some obstacles to overcome and I can then work on production. I’ll keep everyone informed. You need an upper band that has a bayonet lug. I don’t sell them, but there are great websites you can check that do: read my short article here: . Sure, that’s possible. I don’t recommend doing that at all since it would only be taped and could move around becoming quite dangerous. are these for sale now? Oh yes, click on the Bayonet tab at the top and you can order from there.